The fracture is an infraction of the integrity of a bone in its various axes. Open – ruptured skin integrity, showing a protruding bone fragment. The fracture can affect one or more bones throughout the body – facial, cranial, bones of upper limb, lower limb, spine, ribs, and pelvic bones. Bone fracture is a result most often of trauma under the influence of mechanical factors with great force. In some cases, the fracture can also occur after a slight trauma due to reduced bone strength or damaged bone composition. The symptoms of a bone fracture are pain and swelling, impaired function of the affected joint and deformation. The most common symptom is pain. It is very strong and does not diminish unless action is taken. As the bone is broken, the shape and anatomy of the affected area change. This is very painful and it is even impossible to carry out full capacity movements in the area. All of these symptoms can also be seen in similar problems such as a sprain, so it is necessary to visit a specialist to determine the nature of the problem. The fracture is diagnosed by certain imaging studies – computed tomography and radiography. Treatment of bone fracture requires the intervention of an orthopedist. Depending on the type and severity of the trauma, the treatment can be conservative or surgical. Conservative treatment consists of analgesia and immobilization with splint, cast, or braces. Some fractures require surgical treatment for fixation of the affected bone or restoration of the integrity of affected vessels, nerves and tendons. In some cases, bones are reinforced with metal. Possible complications are deep vein thrombosis, pulmonary embolism, septicemia (in the case of open fractures), respiratory distress syndrome, fatty embolism syndrome, delayed adherence, large bowel injury, local infection, damage to joints, muscles or tendons. On rare occasions, a serious complication, known as compartment syndrome, can occur, which if untreated can result in amputation of the affected limb. The feeding is an extremely important part of bone recovery after a bone fracture. An adequate protein intake, the intake of anti-inflammatory substances, minerals and multivitamins is required. The sprain is a traumatic injury, a violent or sudden wrench or twist of a joint with stretching or tearing of ligaments. It is usually a minor injury resulting from sports, exercise, or other physical activity. 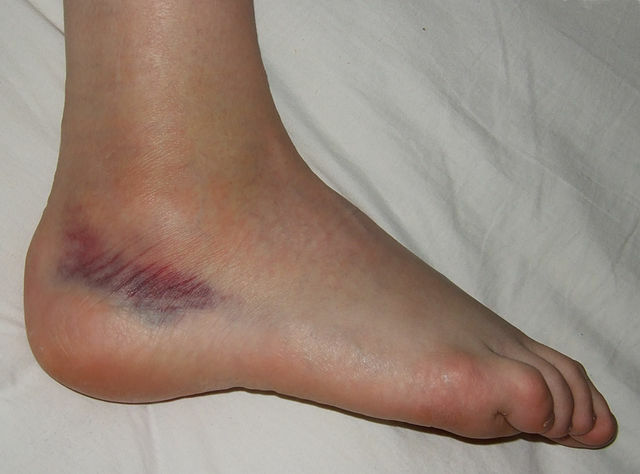 Sprain occurs after a sudden and unexpected movement. It occurs when a force of twisting is applied to the joint when it is weighted. This causes the tendon to stretch more than normal. Use of sports equipment that does not fit the capacity of the individual. In general, sprains are easily prevented – with training and proper warming up. This reduces the load in the muscles and protects against injuries. The sprain occurs most commonly in the ankle, knee, wrist or elbow. The first symptom of a sprain is pain during the injury. Swelling, muscle stiffness, soreness or tension, and bruising may occur. If the damage is more serious, joint instability, rupture of the muscle or tendon may occur. The pain is strong during the first 1-2 days. In the case of a sprain, the joint has to be immobilized. The application of a cold compress limits the edema and relieves the painful spasms. In some cases, painkillers may be necessary. Normally, the sprain is easily diagnosed by the doctor based on the patient’s complaints and how the trauma has occurred. It is possible to assign an X-ray image, and if the injury is more severe, other imaging studies are used to establish the severity of the trauma. The recovery time is individual and depends on how severe is the spraying. It is usually a minor injury, but in some cases the sprains can be serious, and recovery can take weeks of rehabilitation. Rehabilitation is one of the most important steps to healing. It can consist of a whole program that can be done at home or in a medical center. In the majority of cases, sprains are treated without surgery. For certain sprains, various aids may be needed to immobilize the affected areas. Once a muscle or tendon has been injured once, they are susceptible to injury again, especially if the patient returns to normal physical activity too soon. Some herbs and nutritional supplements can help speed up the recovery after the trauma. Vitamin C and beta-carotene are used as the body uses them to create new connective tissue. Fracture: The fracture is an infraction of the integrity of a bone in its various axes. Sprain: The sprain is a traumatic injury, a violent or sudden wrench or twist of a joint with stretching or tearing of ligaments. Fracture: The fracture can affect one or more bones throughout the body – facial, cranial, bones of upper limb, lower limb, spine, ribs, and pelvic bones. Sprain: The sprain can affect one or more joints throughout the body. It occurs most commonly in the ankle, knee, wrist or elbow. Fracture: Fracture is a result most often of trauma under the influence of mechanical factors with great force. It can also occur after a slight trauma due to reduced bone strength or damaged bone composition. Sprain: Sprain occurs when a force of twisting is applied to the joint when it is weighted. Fracture: The symptoms of a bone fracture are pain, swelling, impaired function of the affected joint, and deformation. Sprain: The first symptom of a sprain is pain during the injury. Swelling, muscle stiffness, soreness or tension, and bruising may occur. Fracture: The pain is very strong and does not diminish unless action is taken. Sprain: The pain is strong during the first 1-2 days. Fracture: The fracture is diagnosed by computed tomography and radiography. Sprain: Normally, the sprain is easily diagnosed, based on information of the patient’s complaints and how the trauma has occurred. 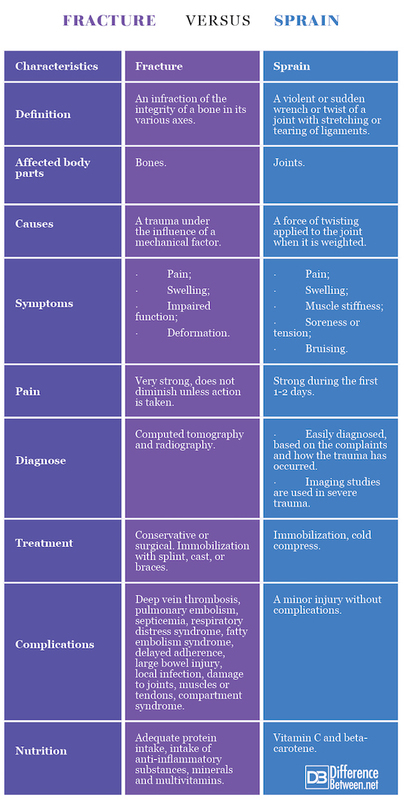 If the injury is more severe, imaging studies are used to establish the severity of the trauma. Fracture: Depending on the type and severity of the trauma, the treatment can be conservative or surgical. Conservative treatment consists of analgesia and immobilization with splint, cast, or braces. Sprain: In the case of a sprain, the joint has to be immobilized. The application of a cold compress limits the edema and relieves the painful spasms. In some cases, analgesia may be necessary. Fracture: Possible complications are deep vein thrombosis, pulmonary embolism, septicemia, respiratory distress syndrome, fatty embolism syndrome, delayed adherence, large bowel injury, local infection, damage to joints, muscles or tendons, compartment syndrome. Sprain: The sprain is usually a minor injury without complications. Fracture: An adequate protein intake, intake of anti-inflammatory substances, minerals, and multivitamins is required. Sprain: Vitamin C and beta-carotene can help speed up the recovery after the trauma, as the body uses them to create new connective tissue. The sprain is a traumatic injury, a violent or sudden wrench or twist of a joint with stretching or tearing of ligaments. The fracture affects bones, while the sprain affects joints. Fractures are a result most often of trauma under the influence of mechanical factors with great force. Sprain occurs when a force of twisting is applied to the joint when it is weighted. The symptoms of a bone fracture are pain, swelling, impaired function of the affected joint, and deformation. The symptoms of a sprain are pain, swelling, muscle stiffness, soreness or tension, and bruising. 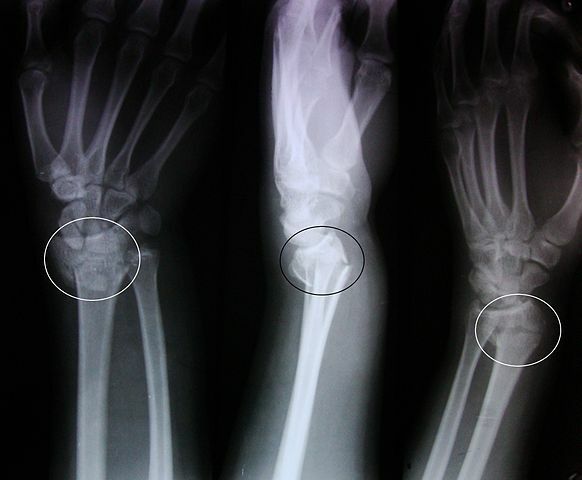 The fracture is diagnosed by computed tomography and radiography, while the sprain is easily diagnosed based at the patient’s complaints and how the trauma has occurred. Imaging studies are used if the injury is more severe. The treatment of a fracture can be conservative or surgical. Conservative treatment consists of analgesia and immobilization with splint, cast, or braces. The treatment of a sprain includes the application of a cold compress, analgesia, and immobilization of the joint. Possible complications of a fracture are deep vein thrombosis, pulmonary embolism, septicemia, respiratory distress syndrome, fatty embolism syndrome, delayed adherence, large bowel injury, local infection, damage to joints, muscles or tendons, compartment syndrome. The sprain is usually a minor injury without complications. In case of a fracture an adequate protein intake, intake of anti-inflammatory substances, minerals, and multivitamins is required. In case of a sprain, Vitamin C and beta-carotene can help speed up the recovery. Dr. Mariam Bozhilova Forest Research Institute, BAS. "Difference Between Fracture and Sprain." DifferenceBetween.net. June 4, 2018 < http://www.differencebetween.net/science/health/difference-between-fracture-and-sprain/ >. Browner, B., J. Jupiter, A. Levine, P. Trafton (Eds.). Skeletal Trauma – Fractures, Dislocations, Ligamentous Injuries. Philadelphia, London, Toronto, Montreal, Sydney, Tokyo: W.B. Saunders Co. 1992. Print. Dandy, D., D. Edwards. Essential Orthopaedics and Trauma, 4th Edition. Edinburgh, London, New York, Philadelphia, St. Louis, Sydney, Toronto: Churchill-Livingstone. 2003. Print. Takov, E., P.Tyvchev (Eds.). Fractures - diagnosis and treatment. Sofia: Venel. 1996. Print.